Important Info: Due to comfort, passengers weighing over 275 pounds (125 kilos) may be required to purchase an additional seat. Choose from our Souvenir Photo Package, a professional photo of you in front of your helicopter, for just $25 or a private limousine transfer for up to 9 passengers for just $199. 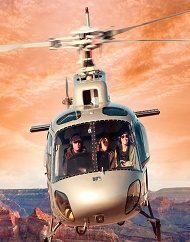 Instantly save up to $124 per person when you book the Grand Canyon West Rim Extended Helicopter Air Tour Featuring a longer 30 mile flight above and below the West Rim of the Grand Canyon! Discover the power and majesty of nature by soaring above the Grand Canyon landscape with your own luxurious set of wings. 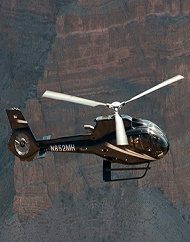 With an Extended Grand Canyon Helicopter Air Tour, you’ll have the once-in-a-lifetime opportunity to soak up the exhilaration and awe previously reserved for the birds that call this magical Arizona location their home. Reserve your seats early for the best price and availability. 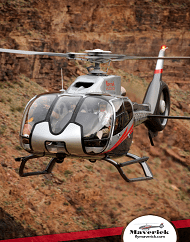 As the longest non-stop Grand Canyon helicopter tour available for those who want to explore the West Rim, you’ll encounter more than 30 miles of jaw-dropping sights from the comfortable, air-conditioned cabin. With each mile, you’ll discover millions of years of geological evolution as the colorful walls of the famous canyon provide a tapestry into the history of nature. 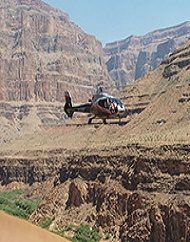 This is one of a few tours to travel this expansive distance on an air only tour, travel twice as far and dip below the rim of the Canyon so you may enjoy your view in from your helicopter, featuring large panoramic sightseeing windows. 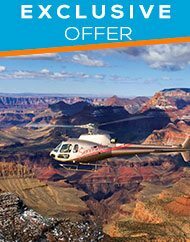 With the Tour Exchange, you’ll save up to $124 per person on this incredible Grand Canyon helicopter tour – with deals this great we recommend you book fast! Feel the goosebumps rise on your skin as you look down on rugged formations preserved from the Paleozoic era, and landscapes between 250 and 550 million years old. It’s no wonder the Grand Canyon draws millions of visitors per year with its unbelievable size, rich palette of colors, and a raw beauty sure to stay fresh in your memory forever. 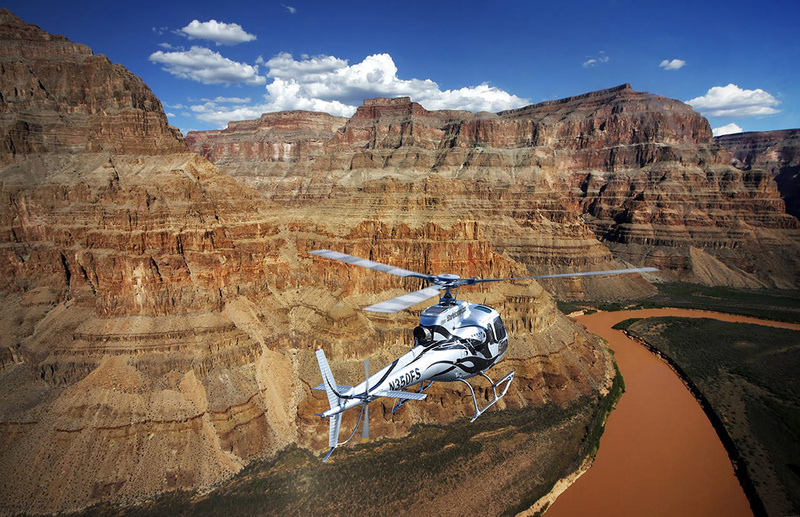 With your Grand Canyon helicopter tour, you can get the ultimate tourist experience. The exclusive extended tour is an all-access adventure into the raw grandeur of the western rim. Glide past volcanoes steeped in years of history, uncover the enigma of Fortification Hill, and feel your heart accelerate as you become one of the lucky few to descend into the depths of the canyon. Besides giving you plenty of opportunities to create your own Grand Canyon photo album, your trained pilot will also give you an in-depth education on your journey. At the close of each tour, we welcome every guest into the comfort and elegance of a luxury Mercedes Benz for the final leg of your adventure. Your car will take you both to and from our private tour helicopter facility. 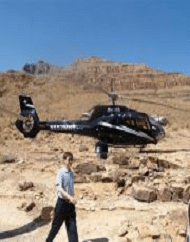 If you’re looking for the ultimate opportunity to explore the marvel of the Grand Canyon in style, the extended Grand Canyon helicopter tour is the perfect tourist spectacle. Overall, the tour is approximately four hours long, so it’s best to leave a good portion of your day free. The full experience includes your round-trip hotel drop off and pick up, dripping in luxury every step of the way. Once we pick you up from your Strip hotel, approximately 90 minutes prior to flight departure, you’ll go straight to our fully-equipped Boulder City terminal, located about 30-45 minutes away from the heart of Vegas. Your flight will last 70 minutes, and we request that you contact your tour provider at least 24 hours before your departure to confirm your pick-up time and location. At the Tour Exchange, we’re proud to offer a VIP Grand Canyon experience for a price that doesn’t break the bank. Book your aerial adventure today! After purchase, you will receive an email receipt confirming your reservation. An additional confirmation email will follow with the exact pick-up time and location for your hotel as well as the contact number for your tour provider. If you have any questions, please call our friendly Travel Concierge at 844-868-7392. 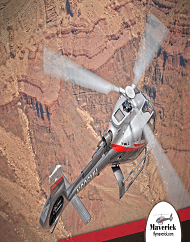 Instantly save $20 per person on the Grand Canyon Helicopter Air Tour Flight by Mustang Helicopters. 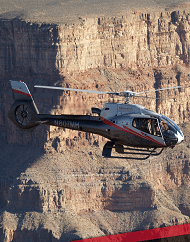 Reserve your seats today on this popular Grand Canyon helicopter tour. 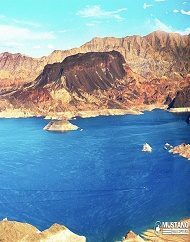 Soar above the Southwest during a tour of this beautiful region, including highlights of Hoover Dam, Lake Mead and the West Rim of the Grand Canyon. Save $100 per person when you book our Grand Canyon West Rim Indian Adventure helicopter landing tour. Fly below the rim of the Grand Canyon. 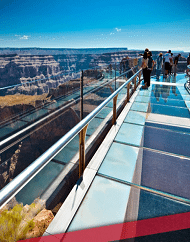 Board a hop-on-hop-off shuttle to the Hualapai Ranch, Eagle Point home of the Grand Canyon Skywalk and the famous Guano Point with spectacular views of the Colorado River. 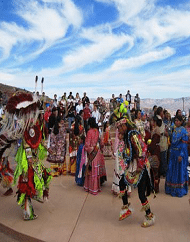 Instantly save $10 per person on the Grand Canyon Indian Territory helicopter tour and enjoy two landing points in the Grand Canyon plus a bonus flight over the Vegas Strip! This breathtaking Canyon landing tour lands 3,500 feet into Indian Territory. Enjoy champagne 300 feet above the mighty Colorado River. 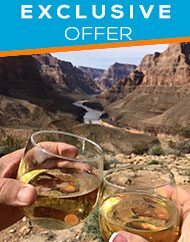 Instantly save $20 per person on this breathtaking Grand Canyon Picnic Landing tour by Mustang Helicopters. Experience picturesque aerial views and natural splendor plus unique views of the West Rim. Land on a private bluff for your picnic. includes complimentary round-trip transfers from all major Las Vegas hotels. 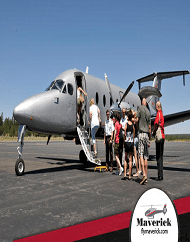 Maverick Airlines Tribal Spirit Grand Canyon Landing Tour. 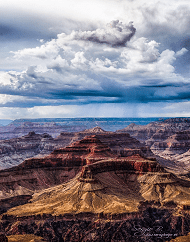 The exquisite beauty and mystique of the Grand Canyon is only a short flight away! Instantly save $10 per person on the Grand Canyon Helicopter Floor landing with Black Canyon River Rafting tour. One of the most amazing ways to experience the Grand Canyon is with a landing tour and the added bonus of river rafting through the Black Canyon. This leisurely float on the Colorado River including lunch. 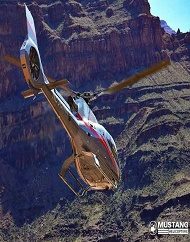 Instantly save up to $130 per person on this Grand Canyon Helicopter Tour - Sky Dancer Picnic Landing Tour. Enjoy a champagne picnic lunch 4,000 feet below the rim including views of the Colorado River. 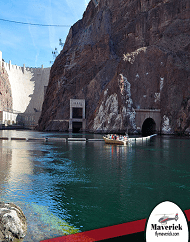 Package includes round-trip transfers and WiFi in a luxury Mercedes Sprinter, views of Hoover Dam. 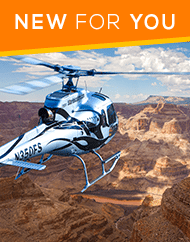 Save $289 on a Private Grand Canyon helicopter tour. 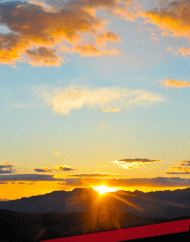 Take off just prior to sunset with Serenity Helicopters and enjoy this breathtaking Grand Canyon helicopter landing tour with Champagne, light picnic snacks and a flight over the Las Vegas Strip. One price for up to 6 guests, includes hotel pickup and drop-off. 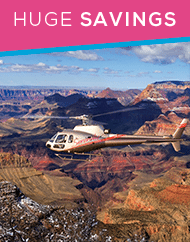 Instantly save $106 per person on the Private Grand Canyon Helicopter Air Only Day Star Tour! If you're looking to experience an amazing flight through the majesty of the Grand Canyon from the air, the Day Star private tour is for you. This single-price is good for up to 6 passengers and will fly you over Lake Mead, Hoover Dam, and The Grand Wash Cliffs, all in route to the West Rim of the Grand Canyon. 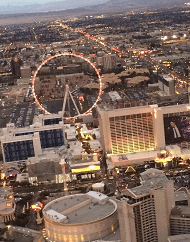 Instantly save $301 on the Las Vegas Night Strip Flight Helicopter Wedding Package! 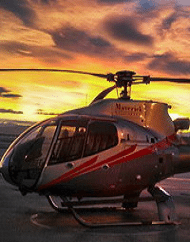 The ultimate Las Vegas helicopter wedding package is here. 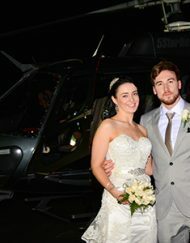 This truly unique and spectacular way to celebrate and say "I Do" Get married in style with a night Strip helicopter flight boasting amazing views and memories. Book online!